SlideRocket is an innovative online presentation editor that allows you to create stunning presentation that look like no other. Not only that you can create new presentations from scratch, but you can also import old Power Point and Google Docs files and transform them into works of art. Colaborative creation, social sharing integration, access from anyu devices, synchronization, monitoring of viewer trends, dynamic data collection from spreadsheets, twitter and finance feeds, and state of the art security represent only the tip of the iceberg. Awesome Online collaborate platform! 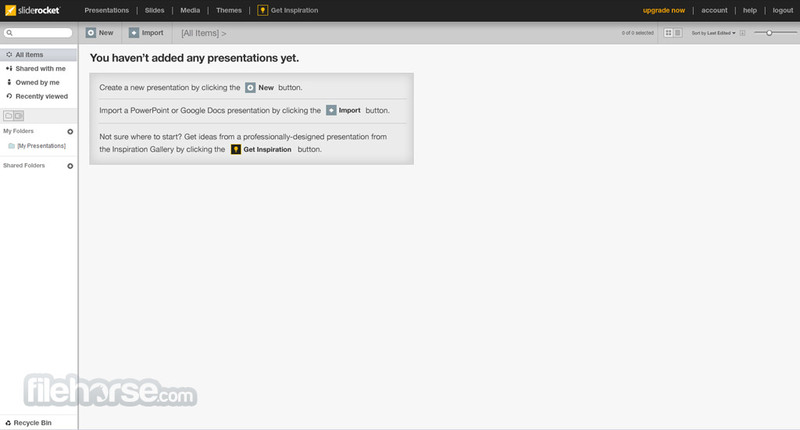 Enhance your presentations with professional tools and content! Creation of presentations is not an easy job, of your goal is to directly engage professional users, clients or business partners who demand access to data that is presented flawlessly, both with its accuracy and visually. To help professional users to easily achieve total control across entire pipeline of presentation use, developers from SlideRocket have managed to create a very appealing and powerful platform where users can easily manage projects of all shapes and sizes, enable their audience to get access to leading tools for presentation viewing both on computers and mobile devices, and access incredibly comprehensive analytics suite that can track everything from sharing, collaborations, tags, downloads and entire presentation usage history. Created in January of 2008 and launched to the public in late 2008, SlideRocket quickly become very popular all across the world, enabling it to find two owners (WMware in 2011 and ClearSlide in 2013). SlideRocket is a very popular online productivity suite which offers its service as a SaaS platform for creation, editing, management, publishing, sharing and measuring of effectiveness of presentations, which are aimed not only to look pretty but to convey information in clearly understandable and easy to use way that can energize audiences and engage them much more than with presentations made with traditional editors such as PowerPoint and Google Docs. Using incredibly intricate and easily managed editor, users of all knowledge levels can easily create presentations that are based not only on your original designs, but also built on top of many pre-made basic and advanced layouts and themes, infused with multimedia content, shapes, charts, audio, pictures, HD video and even Flash animation that can be used in creation of every type of presentations. From school to work, from home use to large corporations, SlideRocket manages to easily manage presentation that can touch everyone. Most importantly, the process of creation can be done easily in collaborative environment, with easy way to manage libraries of content that can be reused whenever you want, which includes not only manually collected multimedia but also directly imported content from popular online hosting services such as Flickr, Twitter or YouTube. You can even integrate live content into SlideRocket presentations, enabling you and your viewers to see real-time state on YahoO! Finances, Google Spreadsheets and Twitter live feeds! Awesome Online collaborate platform! No matter where your viewers or customers are, how complicated your project is, or how pretty you wish to create it, SlideRocket and its parent company ClearSlide will be there to help you. Even though main dashboard of SlideRocket is very important for easy management of entire presentation pipeline, its editor is something majority of users want to know about. Easily accessible and organized very professionally, SlideRocket offers 9 main tools for infusing presentations with content. Those tools are Text, Picture, Flash, Video, Shape, Chart, Table, Form/Pool and Plugins (which can easily pull content from various online hosting services or present your data in interesting way). SlideRocket is a professional tool, offering only 2 week trial period before users are asked to pay for a premium tier, which starts at $24 per month. SlideRocket is a perfect tool for professionals who want to take full advantage from industry-leading tools for management of presentations in collaborative environment. SlideRocket protects your content investment and opens up a world of previously unavailable possibilities by importing your existing PowerPoint or Google presentations. Wherever you are, SlideRocket's right there with you. Online, offline or mobile you can login, access your presentations and make them available to your customers and prospects 24x7. With a full set of professional design tools SlideRocket helps you create breathtaking presentations that will wow your audience. Combine themes and layouts, shapes, charts, tables, pictures, audio, HD video, and Flash to tell your story without compromise. Collaborate with your co-workers using SlideRocket's slide library. Easily share presentations, slides and assets across the organization to facilitate reuse and consistency while letting SlideRocket do the heavy lifting with automatic version management and content inheritance for always up to date slides. Awesome Online collaborate platform! SlideRocket makes sharing easy. No more supersized email attachments, no more platform or version compatibility issues. 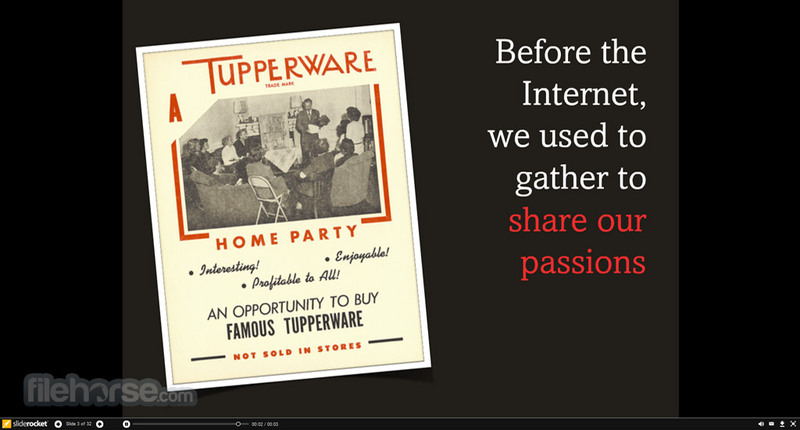 Dynamic presentations take on a whole new meaning with live embedded data in your slides. Pull data in real time from sources like Google Spreadsheets, Twitter live feeds and Yahoo! 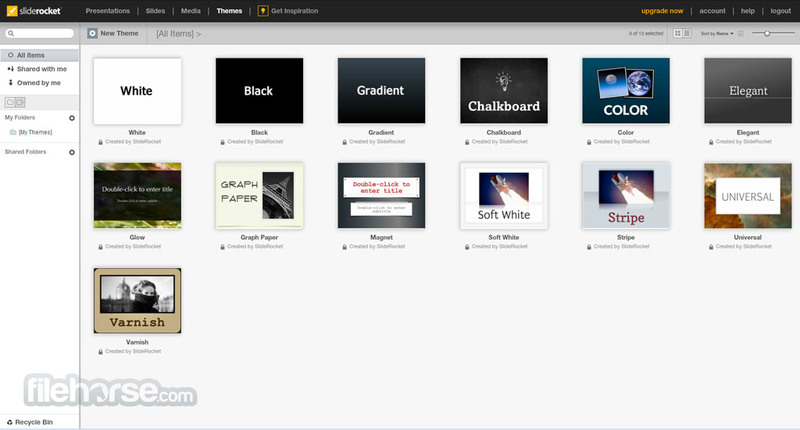 Inspiration is just a click away in SlideRocket’s gallery of professionally designed presentations. Find the creative spark you need to realize your own project and borrow from the experience of the world's best presentation designers to get a head start. Presentations hold some of your most precious data, yet presentation files are often left unsecured, stored on laptops or thumb drives and shared indiscriminately. The reality is that hard drives crash, viruses attack, computers are stolen, and important documents are lost, accidentally deleted or worse, shared with competitors.